Be the first to share your favorite memory, photo or story of Monette. This memorial page is dedicated for family, friends and future generations to celebrate the life of their loved one. Monette Cole, March 5, 1929-July 4,2018. Funeral Service for Monette Cole, 89, will be at the First United Methodist Church, Hollis, Oklahoma on Monday July 9, 2018 at 10:00 A.M. With Don Altum Officiating, Burial will be at Fairmount Cemetery in Hollis, Oklahoma. Mrs. Cole passed away at OU Medical Center in Oklahoma City, Oklahoma Wednesday July 4, 2018. 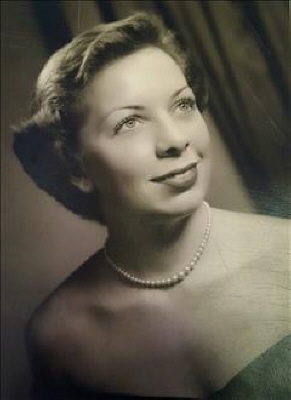 Monette Cole, daughter of Chester and Gladys (Motley) Caswell of Hollis. She married Bill Cole (deceased) of Quanah, Texas on March 8, 1953 in Hollis. A 1951 graduate of Baylor University, she was a member of the Chapter â€œOâ€ P. E. O. Sisterhood, â€™51 Sorosis and First United Methodist Church. She taught Vocal Music and Title 1 Reading in Hollis. Survivors include: Nancy (Cole) Diaz of Edmond, Oklahoma , Robert Cole and wife Sonya of Reno, Nevada; Grandchildren Chris Cole, Allison and husband Justin Wooley, of Mansfield, Texas, Lance Cole of Tahoe City, California, Lexy Diaz of Fayetteville, Arkansas, Kaitlyn Cole and Fiance Peter Zile of Mansfield, Texas and Monica Diaz of Fayetteville, Arkansas. Great Grandchildren: Maison Cole, Braxton and Camden Wooley and Zoey Zile. To send flowers or a remembrance gift to the family of Monette Cole, please visit our Tribute Store. "Email Address" would like to share the life celebration of Monette Cole. Click on the "link" to go to share a favorite memory or leave a condolence message for the family.